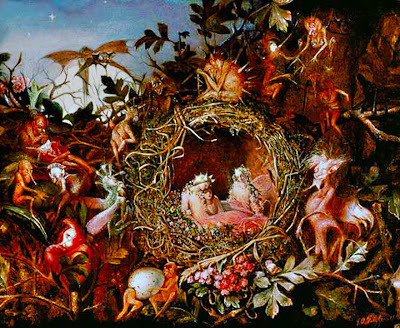 Folks and farmers of Groedicher reported in 1753 that wild fairies of Wunderberg Mountain came down from the hills and visited young children, maids and lads alike. At first these wild fairies or Woods Wives of Wunderberg as they were called, offered the children pieces of bread when they grazed their cattle in the clearing near Glanegg. Time and again the wild fairies visited this clearing in the meadow during the grain harvest. They came down from the hills early in the morning and in the evening when other people went home after work, these wives went out and entered Wunderberg without taking their evening meal. Once it happened that a small chap sat on his horse next to Wunderberg Mountain and his horse was harnessed to the wagon his father was using for threshing the field. Once again the Wild Wives came down from the hill and wanted to carry the boy away using force. The fairies replied: “We will take better care of him and he will have it better with us! We will dote on the little fellow, nothing bad will befall him if he comes with us!” But the father would not let go of the child, and gripped him tightly in his hands. The wild women cried bitter tears but finally departed. Once the wild women came out of the Wunderberg near the Grinding Mill or the Ball Mill, which was called Place of the Ball because it was close to the summit. They snatched a boy, who was grazing cattle in the meadow. This boy, whom everyone knew, was first seen again by woodcutters more than a year later. But now he was wearing a green shift and sat on a tree trunk. The next day his parents went out to find him, but it was all for naught. The child was never seen again. It often happened that a wild fairy came out of the Wunderberg walking toward the village of Anif. This village lay one-half-hour away from Berg. Once there, the wild wife dug holes and storage caches in the mountain. She had extraordinarily long and beautiful hair, which almost touched her heels. A farmer from the village often saw this woman walking back and forth. He fell in love with her immediately, mainly because of her beautiful hair. He could not help himself from going to her, gazed upon her longingly with pleasure and finally, in his simple-mindedness, entered her little cave-hole without being shy at all. No one said anything or even mentioned how unseemly it was.